We can all agree that SVG Europe has gone from strength to strength over the last year. Attendances at our events are up and the quality of attendees is consistently very high, writes SVG Europe chairman David Shield. Our sponsorship base also continues to grow, which allows us to provide better quality events in bigger venues. Our editorial team provides the very best reporting of not just the marquee events, but also the day in, day out business of sports production. So, what has been happening in the wider SVG Europe universe? There are new pay TV players emerging in Europe. DAZN has Champions League rights in Germany, whilst Amazon has some ATP tennis and Premier League rights in the UK. Eleven Sports has acquired UK rights to La Liga. It is too early to tell what that might mean for established pay TV operators in Europe, but for certain there is some pain experienced because of the cost of sporting rights. Many argue that there will be a correction and perhaps the last round of Premier League domestic rights supports this view, but generally increased competition will lead to higher values. The outside broadcast industry in Europe and worldwide has seen further consolidation and new alliances formed. Much progress has been made with the move to IP, which is now seen as the norm for large truck builds. UHD is likewise taken for granted, at least as a 4K SDR offering, but HDR is no longer simply talk; real examples exist and lessons are being learnt. The telcos have their part to play in this revolution as satellite begins to look less useful for UHD contribution and distribution. Meanwhile, the use of remote production continues to increase. Whilst it might be argued that there has always been an element of remote unilateral production at major events, this is happening more often and with more of the technology at the home studio. For example, the ATP is now in its second year of producing the World Feed of ATP500 events remotely and is looking at the possibility of actually providing the court feeds remotely. Reducing cost is often seen as the motive for remote production, but there can be other reasons. Amazon has decided to remotely produce its UK presentation of the US Open Tennis because of the lack of space at Flushing Meadows. As a result its talent will be at the venue but production will be based in London. At the Winter Olympics in PyeongChang earlier this year, Discovery and Eurosport mounted a huge operation relying heavily on elements of remote and cloud production, in particular to support a requirement for 21 languages in 48 markets. Embracing all the elements of remote production they also solved the problems of massive shared storage available across all their markets. HBS on behalf of FIFA TV has just completed a hugely successful World Cup in Russia. The competition has broken all records in terms of fan engagement and the variety of innovations from broadcasters has been impressive. Let’s not forget the challenges for the host broadcaster operating across such a large country, providing uniformly high quality output that caters for the smallest to the most sophisticated broadcasters. Particularly worthy of note was the ability to offer 37-camera coverage in three output formats: 1080i SDR, 1080p SDR and UHD HDR. Congratulations also go to the team at WBS for coverage of the Wimbledon Championships this year. They undertook a massive challenge to take the host operation in-house together with an all-IP workflow solution from NEP. They threw in UHD coverage of Centre Court and HD coverage of all outside courts for good measure, and achieved a fantastic result. Likewise there is acclaim for ETP and CTV, who have just completed a very exciting Open Championship as host broadcaster and are preparing for the Ryder Cup, something we can say is truly European. We all enjoyed France’s performance at the World Cup – let’s hope Europe prevails in Paris! 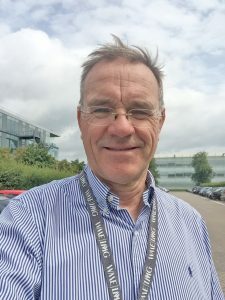 SVG Europe chairman David Shield SVG Europe is global director of Engineering & Technology at IMG. This article is the opening piece in our newly-published 2018 SportTech Journal, which will be available to delegates attending SVG Europe’s Sport Production Summit in Amsterdam on Thursday 13 September. To view a Digital Edition of our new SportTech Journal please click here.